Not a Lithops, but still pretty cool! 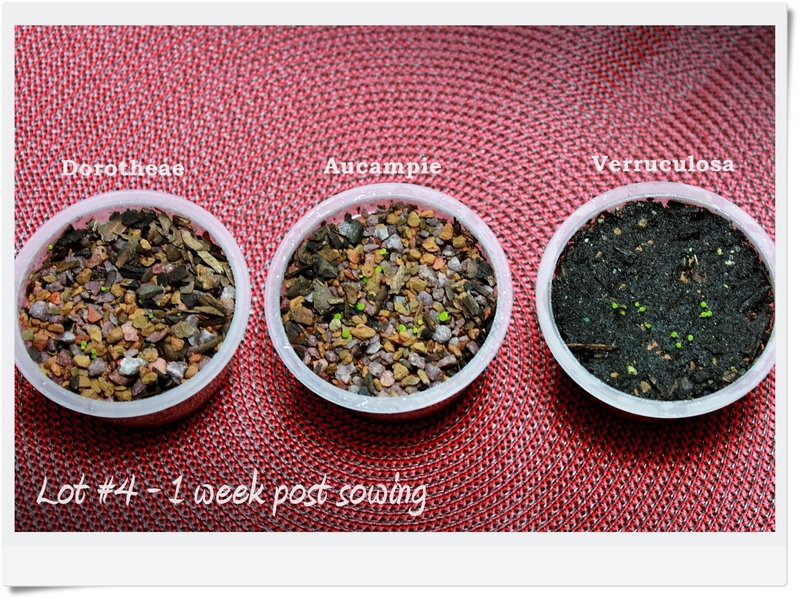 It’s been one week since I planted my forth lot of seeds. I choose to sow directly on the gravel mix I use for my adult plants rather than the sandy baby mix I used last summer. I planted one pot each of Dorotheae, Aucampie, and Verruculosa. The Verruculosa pot was given a topping of cactus soil to see if it would provide a better substrate for the tiny seedlings to anchor to. 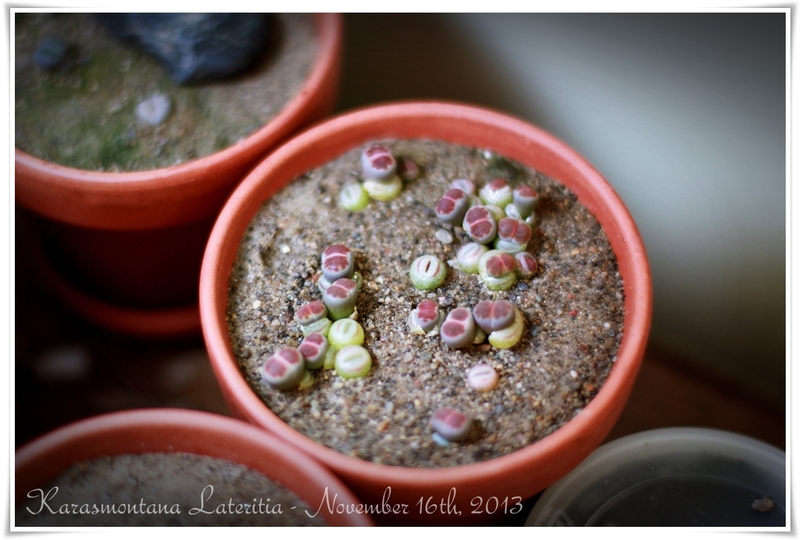 I am very pleased to report that I have 100% germination in all three pots! I’ve never been this successful in the past, so I’m certainly going to take note. 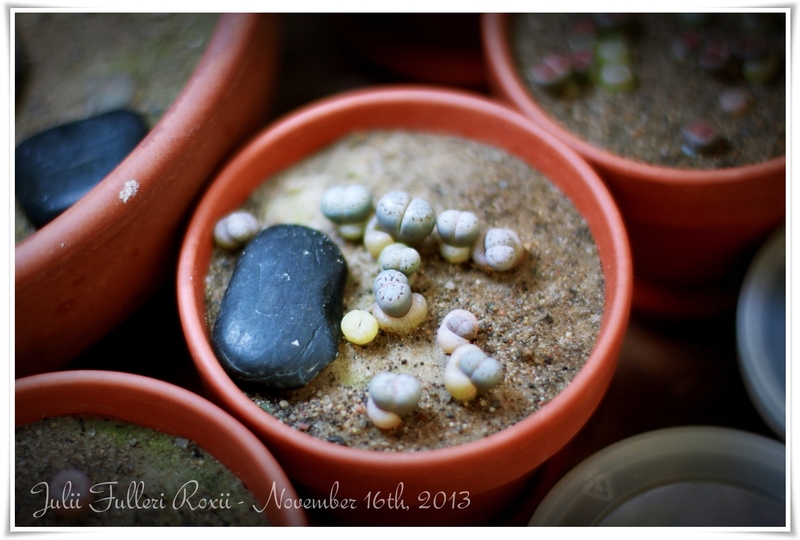 Sadly, I was in a rush when I planted them so will need to “thin the herd” as they grow. The Aucampie seedlings look very strong and robust. I’m very pleased with them. The Dorotheae are smaller, but still look to be quite hardy. It’s interesting to see in this pot, the tiny seedlings have had to push the bark chips aside to reach the light. 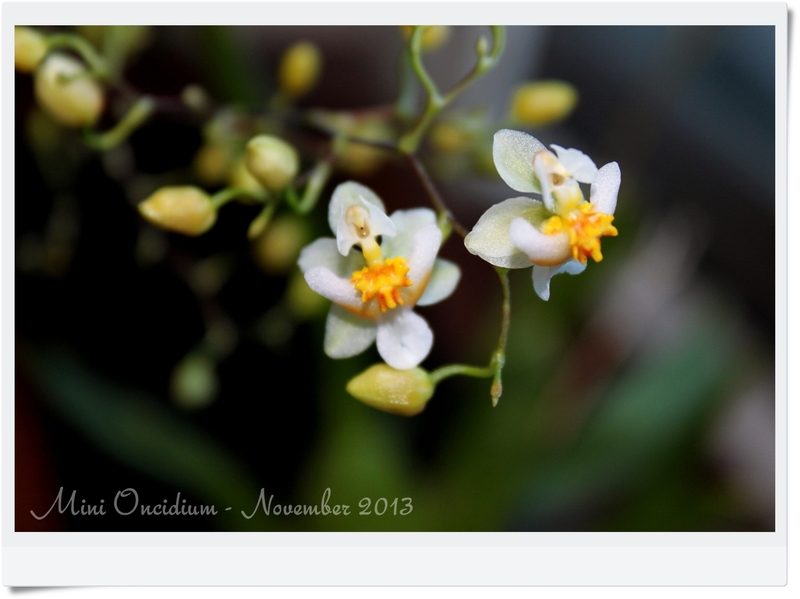 They are so tiny and yet, so strong! The Verruculosa seedlings appear taller and a little leggy, but it’s hard to gauge as they are growing on a smooth surface, whereas the others are nestled into the crevices between the stones. My very initial observation in the Verruculosa pot was that the soil stayed very very wet. I worried about dampening off, but happily I was wrong and everyone looks to be doing well! I don’t know if you’ll recall, but back when I first planted Mixed Lot #2 and there were seedlings popping up all over the place, I identified one that was very very different then all the others. 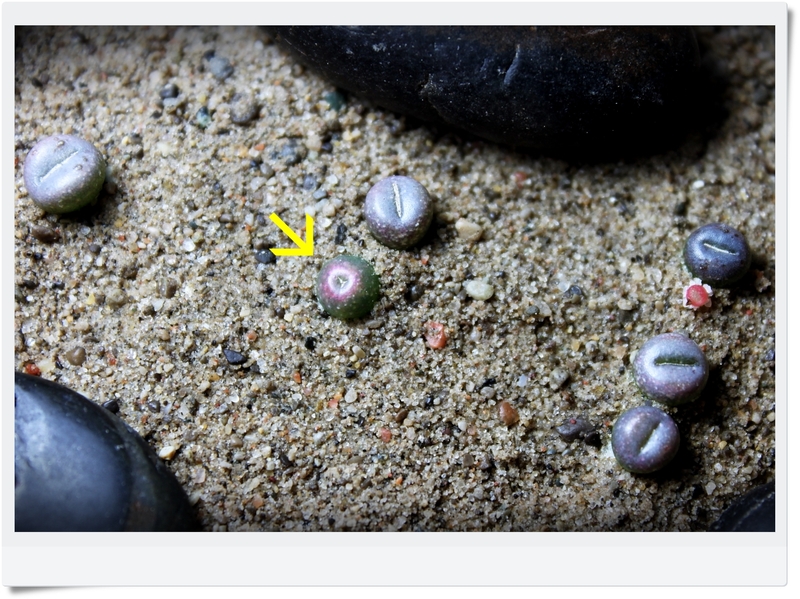 It was a sphere, apple green in colour, with a pink center, and instead of having the typical centre fissure of a Lithops seedling, it had a perfectly round hole similar to a pin prick. 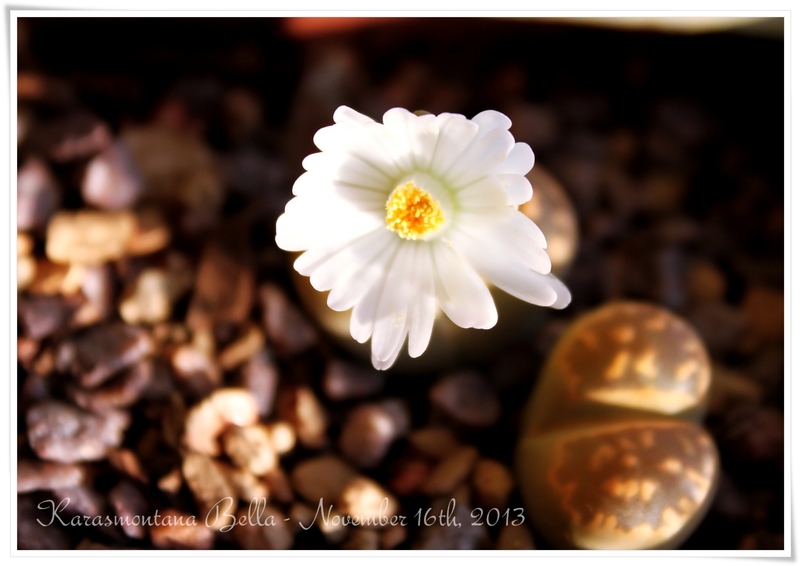 I remember commenting that I wasn’t sure it was a Lithops at all and I was very interested to watch it grow with the hopes of one day seeing what it was going to grow into. 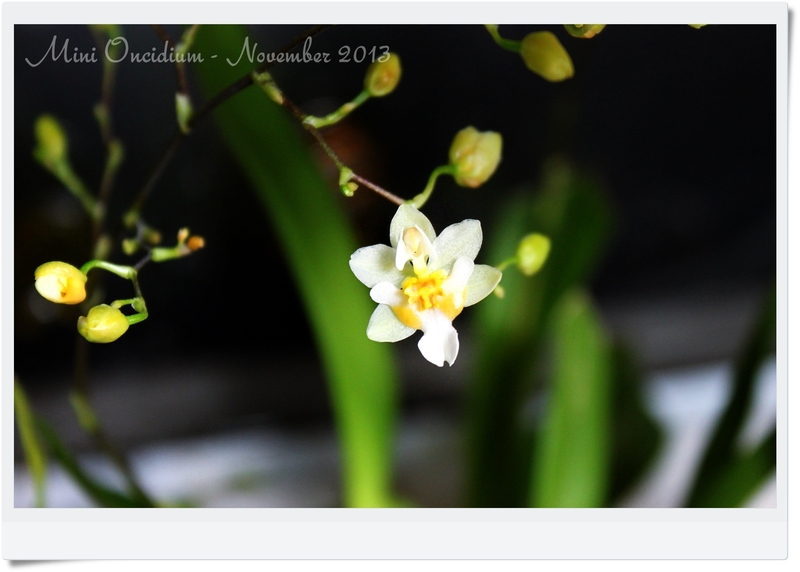 Over the months, the little seedling shriveled up and all but disappeared. It looked very very dead for a long time and appeared to be receding into the soil. I was disappointed, but decided to leave it in the pot and let nature take it’s course. Well, it’s back. 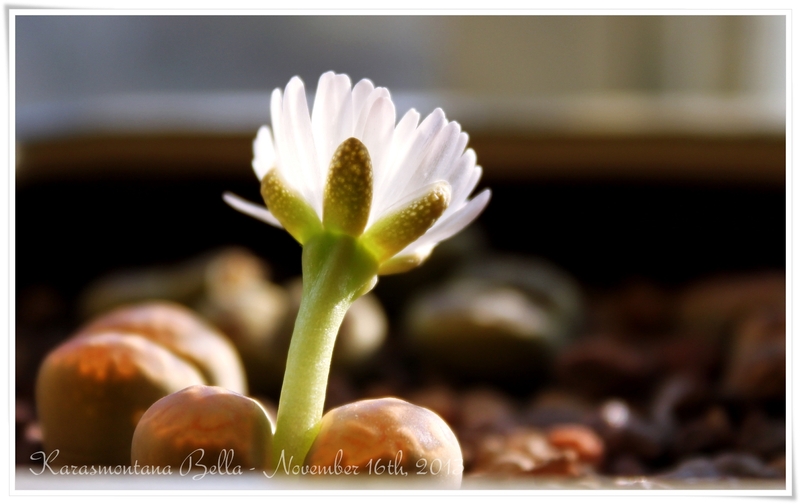 The shriveled seedling has started to split open and I can see a little plant starting to emerge. 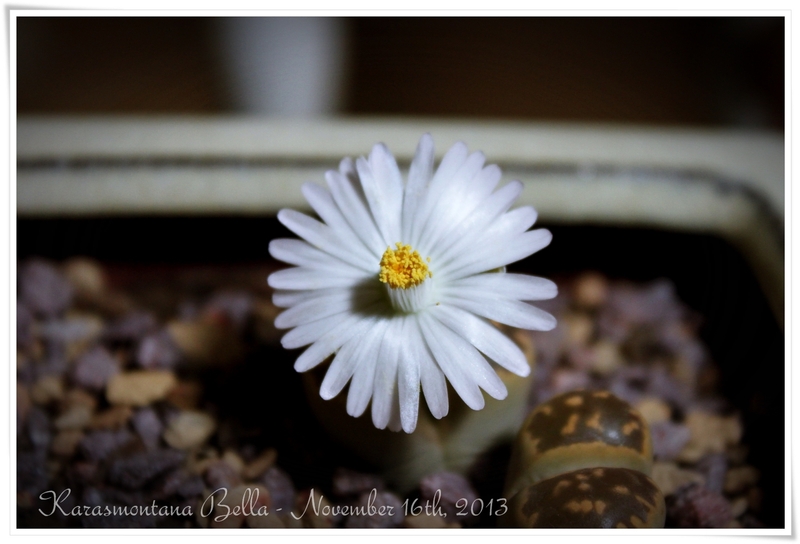 It is very similar to a Lithops in behavior but I’m still struck by how different it was as a seedling and how it may be something completely different, perhaps a close cousin. 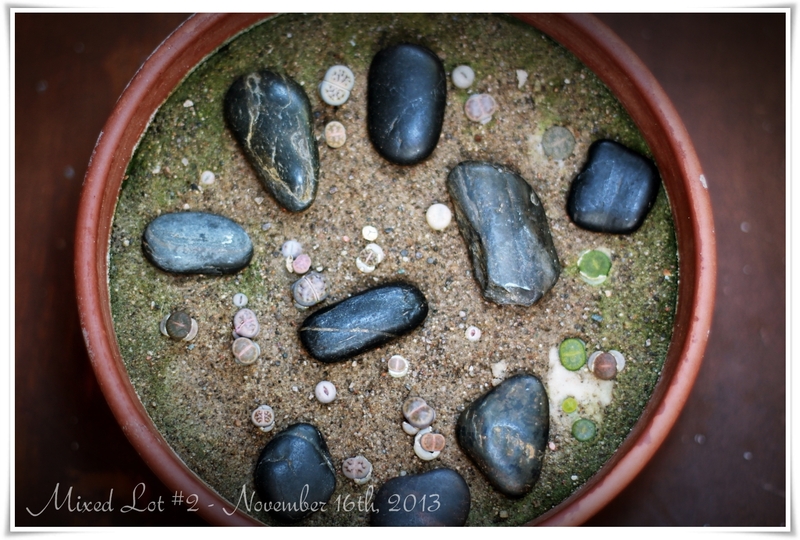 There isn’t enough of the new plant peeking through to make a definitive decision on what exactly is growing there and it is very very tiny now, so Lithops or not, it still might not “make it”. But I will be watching it closely and am eager for it to finally show itself! This is a picture of it as a young seedling (yellow arrow). See the difference? Strange, huh?